Anniversary Wishes for Husband: Think about how your marriage has shaped your life and write a few sweet quotes that come from the deepest corners of your heart. Scribble one out on a note and stick it on the bathroom mirror. Post one up on your husband’s Facebook and tag him on another one on Twitter. Send a cute message to him by text when he is at work. 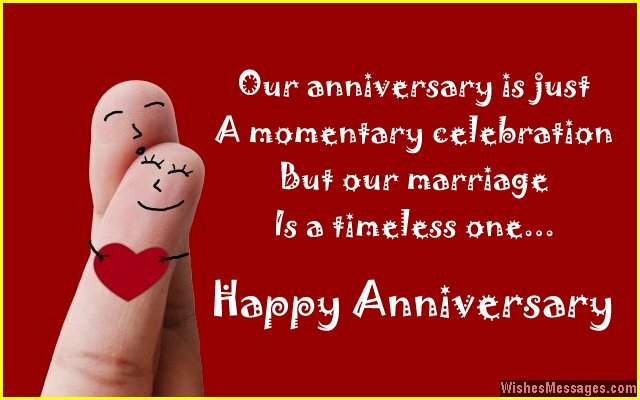 Last but not the least, save the best for a beautiful card and give it to him when you say Happy Anniversary over a romantic dinner. Why such a lot of fuss? Simply because sometimes words are more precious than any gift in the whole world. Your messages will become wonderful keepsakes which you can cherish decades later when you are holding hands in your rocking chairs. 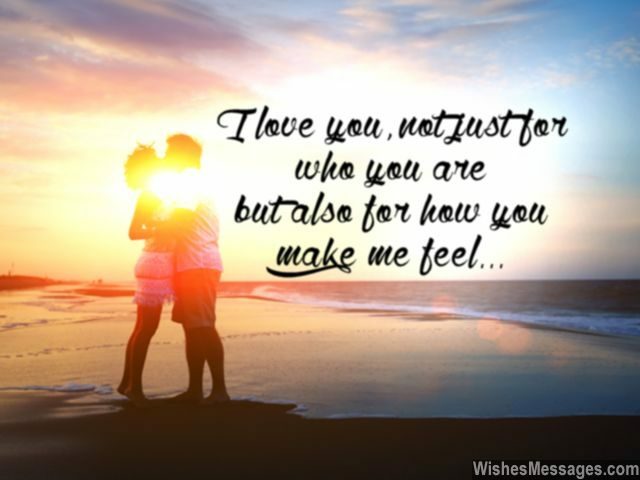 1) I love you not just for who you are but also for how you make me feel. Happy anniversary. 2) My life revolves around yours to the extent that your smile brings sunrise, tears bring thunderstorms and laughter brings rainbows. Happy anniversary. 3) Our marriage may have been a bumpy ride with many speed breakers, but that is what has made us circumvent those obstacles and fly high in the sky. Happy anniversary. 4) Our anniversary is not just a celebration of our wedding day. It is the celebration of every day of being married to an awesome guy like you. Happy anniversary. 5) Our anniversary celebration does not have the colorfulness of piñatas, grandeur of fireworks or the thump of loud music. But it has the colorfulness of our beautiful memories, grandeur of our timeless love and thump of our hearts beating for each other… forever. Happy anniversary. 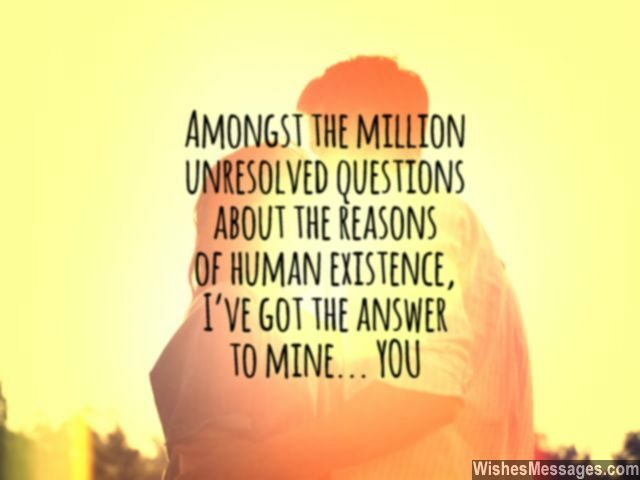 6) Amongst the million unresolved questions about the reasons of human existence, I’ve got the answer to mine – you. Happy anniversary. 7) Do you know what it is that will always sparkle brighter than the diamond in my wedding ring? My eyes, every time I see you. Happy anniversary. 8) No photo frame in this world is big enough to fit the beautiful memories of our marriage. Happy anniversary darling. 9) I don’t want our lives to be quoted as an example of the perfect marriage, but as the coolest adventure ride that two people ever took. Happy anniversary. 10) Just hold me tight and kiss me… I want to go back to the moment when I first realized that we were made for each other. I love you, happy anniversary. 11) Being together has been a journey that we’ve started, walking hand in hand, now and forever. Happy anniversary. 12) Life has nasty ways of reminding me of all its realities but luckily I have you… making every day seem like a surreal dream. Happy anniversary. 13) We are different players in the game of life. But together we make a team that hits a home run with all the balls that life throws at us. Happy anniversary. 14) I’ll post a few of our pictures on Pinterest on a new board… called PERFECT. Happy anniversary. 15) My heart was forever stolen on the day we got married but the only thing different in this robbery is that I knew the robber. I knew he would take good care of it… forever and ever. Happy anniversary, to my handsome thief. 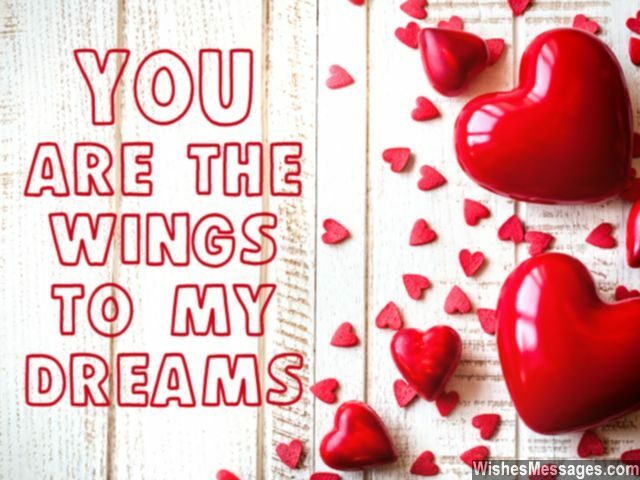 16) You are the wings to my dreams. Happy anniversary. 17) Biology says that a man’s behavior changes as he ages. But you have proved that wrong because you’re still as romantic and charming as you were when we started dating. Happy anniversary. 18) Beautiful memories and priceless moments… that’s how I’d describe spending my life with you. Happy anniversary. 19) Our marriage has never been a puzzle which needed to be assembled. It’s like an empty canvas, just waiting to be painted with the most beautiful colors. Happy anniversary. 20) Like the fizz in our champagne glasses, may our marriage always bubble with happiness, joy and sheer awesomeness. Happy anniversary. 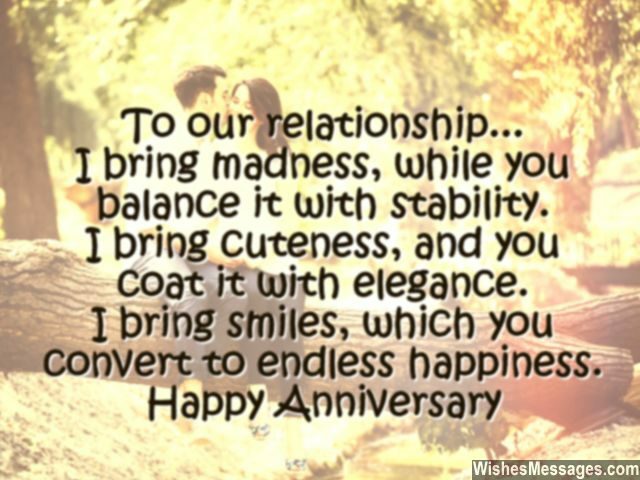 21) To our relationship… I bring madness, while you balance it with stability. I bring cuteness, and you coat it with elegance. I bring smiles, which you convert to endless happiness. Happy anniversary. 22) Just like how the blend of two colors makes a new shade, the blend of trust and understanding has made a beautiful marriage like ours. I love you baby, happy anniversary. 23) If raising a toast to life, having fun and being romantic is what takes for an anniversary celebration, I have been celebrating every single day of my life with you. Happy anniversary. 24) Even though I have a million imperfections, you’ve always made me feel perfect. Even though I have a thousand flaws, you have always made me feel flawless. Even though I’ve made hundreds of mistakes, you have always made me feel as if I am the best. Happy anniversary. 25) You are not just my better half. You are the half that makes my life better than the best. Happy anniversary. 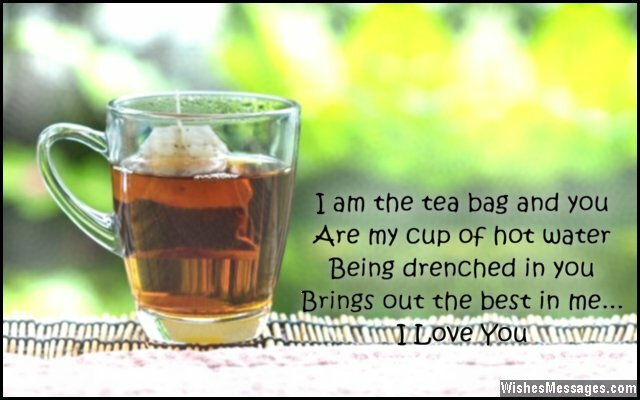 26) I am the tea bag and you are my cup of hot water. Being drenched in you brings out the best in me. Happy anniversary. 27) The harsh realities of everyday life, bitterness of failure at work and regrets of the past – all these things become bearable just because I have a husband like you. Happy anniversary. 28) Like the sun is to a blooming flower, hummingbird is to the hibiscus and moth is to a flame, we are to each other – inseparable. Happy anniversary. 29) From an alarm that wakes me up for yet another bright day in life, to a sweet bedtime melody that puts me to rest at night – you are my everything. Happy anniversary. 30) Women generally enjoy a honeymoon once in their lives, I enjoy it every day – because you make our lives feel like one. Happy anniversary. 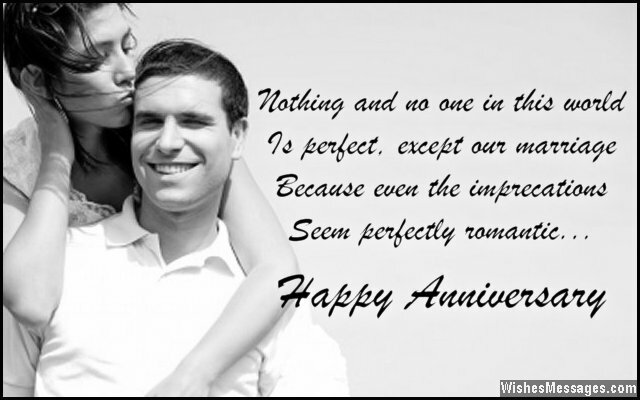 31) Our anniversary is just a momentary celebration, but our marriage is a timeless one. Happy anniversary. 32) Unicorns, fairies and angels – even these seem real in front of our marriage, which is so perfect that it seems almost unreal. Happy anniversary. 33) Every day spent with you is like a FOREVER and every day spent without you is like a NEVER. Happy anniversary. 34) You are not just a husband, you are an inventor. You have re-invented the meaning of the words Romance and Love ever since the day we got married. Thank you for making life so much more beautiful. Happy anniversary. 35) I was a simple girl who wished for beautiful wedding ceremony. But you changed my life by giving me that as well as a blissful marriage. Happy anniversary. 36) Nothing and no one in this world is perfect except our marriage, because even the imperfections seem perfectly romantic. I love you, happy anniversary. 37) As we grow older, every wrinkle signifies a beautiful memory that we have shared together… you as my husband and me as your wife. Happy anniversary. 38) The definition of a fun marriage doesn’t include relaxing holidays, cozy weekends or beautiful homes. It includes a husband like you who makes holidays relaxing, weekends cozy and a home, so beautiful. Happy anniversary. 39) The only reason I chose a simple wedding ceremony was because I knew that the grandeur of our married life was going to make up for it. Happy anniversary to the best husband ever. 40) On our wedding day, we exchanged wows at the altar. Ever since that day you’ve done everything you could to make me go WOW. Thanks for everything baby, happy anniversary.